RBC — In what may be an unprecedented move by the county, commissioners approved a resolution to establish impact fees on residential, commercial and industrial new development in Rio Blanco County. While nearly half of Colorado’s counties have some form of impact fees to help cover the costs of expanding and maintaining infrastructure, RBC’s fees are the first to be applied to the energy industry. Industry officials had asked the commissioners to consider a six-month delay on the fees during a public hearing two weeks ago, citing the need to find a “win-win” situation for the county’s infrastructure problems and industry’s financial balance. Two years ago, in April 2006, the county established an “emergency impact fee” of $3,000 or $6,000 for each oil or gas well “spudded in.” Additional wells on multi-well pads paid a $2,000 fee. The fees collected by the county thus far, totaling $1.4 million, were transferred from the emergency fund into a newly created impact fee trust fund. The new fees, which affect all new development — residential, commercial and industrial — will start in July. Fees collected can only be used for prioritized capital infrastructure projects, such as the proposed construction of a new justice center and improving County Road 5, the Piceance Creek Road The repair of 42 miles of the heavily impacted county roads is expected to cost the county as much as $90 million. Commissioner Ken Parsons said he met with Colorado State Treasurer Cary Kennedy last week and discussed possible governmental funding mechanisms for addressing the problems on County Road 5. Commissioner Forrest Nelson directed an informational tour of the Piceance Creek basin for the Yampa Valley Economic Development Council, attended by the new commissioner for the Colorado Department of Transportation, Senator Jack Taylor, Rep. Al White, and city council members and county commissioners from around the region. 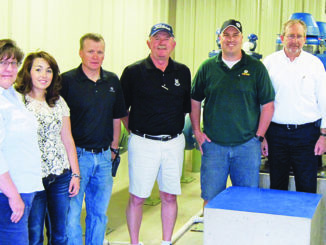 The tour included a visit to Shell’s research project, the Enterprise gas plant and a drive-by of the Piceance Creek Road. n Rio Blanco County Road and Bridge Director Dave Morlan said county crews were finally able to “punch a hole” through the snow on Ripple Creek Pass. “I haven’t seen that much snow in all the years I was up there blading,” Morlan said, attesting to the heavy winter residents experienced this year. Ripple Creek Pass remains closed until crews can finish the snow clean-up and mag chloride application. According to Morlan, Dunckley Pass and Burro Mountain are still closed as well. n Enterprise is expected to bring in as many as 35 giant-sized loads of heavy equipment during the second phase of the gas plant construction project that started recently. The equipment will require the application of four 6×12 ft. sheets of steel laid across 13 county bridges to bear the load. Morlan said the concern lies with the fact many of the bridges were built in the 1960s and not designed to manage the weight of such large equipment. Rangely’s Water and Sanitation Department prepares drinking water and treats wastewater released back to the White River. It is a complex system that requires a significant investment in time and money. Tickets are now available for the 2014 Spring Gala Black & White Masquerade Ball to benefit the Pioneers Healthcare Foundation. 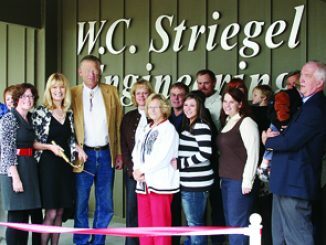 Larry “Bud” Striegel has been nominated by Colorado Northwestern Community College for the 2011 Council for Resource Development (CRD) Benefactor Award, announced Russell George, CNCC president.